Dallas was rocked late Friday night by a brazen attack on a police headquarters. An assailant opened fire on the building and planted at least one improvised explosive device before escaping. 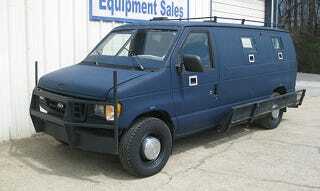 During the chase, it became clear that the shooter was not in a common vehicle, but a dark painted up-armored van. Details about that van are now emerging. The van used in the shooting spree is said to have a matching VIN number to one that was sold by the Pickens Country Sheriff months prior. During the pursuit following the initial shooting at the police station, the sinister-looking van was seen ramming police cruisers and heard exchanging fire with officers. Eventually, police cornered the suspect, named as James Lance Boulware, in the van and began negotiations with him. Police snipers disabled the van by firing a .50 caliber round through its engine block at around 4:30AM local time, some four hours after the initial attack occurred. After an initial call to police and sporadic verbal exchanges, negotiations broke down with the suspect. Fearing that the van was packed with explosives, snipers once again brought their .50 caliber rifles to bear, this time firing through its front windshield, killing the suspect. Police then used a robot to ensure the driver was dead and to inspect the vehicle. After sunrise, detonations were heard near the sight of the standoff, and the van went up in flames. Presumably, there were indeed explosives in the vehicle and that the police used a controlled detonation to destroy them in place. A profile of Boulware is slowly beginning to come to the surface. It depicts an increasingly agitated and violent man who threatened judges, had a domestic violence record, and was known by family members as a threat. This behavior was said to only have increased in intensity recently as a result of losing custody of his son. This brings into question how this man, who had such a violent track record, was able to obtain firearms and explosives. His access to armored vehicles replete with gun ports (which there is no current law against) should also come into question as police deconstruct what was likely intended as a mass murder event. This year, President Obama put forward new regulations via an executive order on how the military makes its surplus hardware available to domestic police departments. Heavy weapons in particular have been a large part of this issue. Yesterday’s events could add more fuel to the debate over militarized police. One reason local police departments have justified .50 caliber weapons in their inventory is for disabling vehicles via shooting out their engine blocks, as well as for this exact scenario, where an attacker has an armored vehicle that is hardened against handgun up to medium caliber rifle ammunition. In fact, a ban on the military offering .50 caliber and larger weapons and ammunition to police departments is a key part of President Obama’s recent executive order. Just as body armor remains available to anyone who has the money to buy it, even military grade ballistic helmets and heavy assault chaps, throat protectors, vests and torso covers, such as those used in the in the Colorado movie theater massacre, people can also freely purchased up-armored vehicles. This is precisely why police have stated they need to retain measures against such exotic attacks.